Haddam Meadows-There were a couple of things I had in my mind when I set out to look for birds on Monday. First of all, I wanted to make a point of using my camera with a tripod to take videos and pictures. I just bought an extra quick release plate which allows me to easily switch between using the scope or my camera on the tripod. The other thing I wanted to do was try out the new chair blind that I recently purchased. I started my morning at Haddam Meadows State Park. There was the usual mix of birds that you would expect to see this time of year in Connecticut including lots of Song Sparrows like the one above and also a good number of Red-winged Blackbirds in the swampy portion of the park. I did see my first Tree Swallows of the year perched in the highest branches. They were preening and catching a little sun. It was nice not to worry about my hands staying steady while taking photos using the tripod but it didn't get me any closer to the birds. So would the new bird blind solve that problem? The Chair Blind Blues-I recently mentioned that I had purchased the Ameristep Chair Blind. After setting it up in a wooded location, I sat in it for about two hours. I could hear Tufted Titmice and Black-capped Chickadees flying right past me. Their were also Cedar Waxwings and Northern Cardinals nearby as well. Unfortunately, none of them landed in a location where I could snap a photo. The blind sets up easy enough but I can't say that I enjoyed using it. Here are a few of the problems that I had while using this product. The chair is attached to the blind so that any movement by the person seated in the chair causes the whole blind to move. It is big enough to sit in but the cramped space makes it difficult to set your gear up. It is designed with flexible metal bars that attach to the chair and tent portion. It feels very awkward when you have to fold this product back up again. It's as though you are trying to force it back into shape and it barely fits back into the carrying bag. It is 11 pounds which doesn't sound like much but it is a pain to lug around if you add that to your tripod, camera and binoculars. I just don't think it's going to work out for me. Taking photos from your car or photos from a window in your house are two easy and effective ways to get a closer view of birds without scaring them away. I plan on making a list of places that have already built permanent blinds for wildlife viewing. I've found a few but they don't seem to be set up in a location where you would see a lot of birds. Setting up a tent in the backyard and making some holes from which to look through. Making you're own portable bird blinds using camouflage material-(I think Wal-mart sells it) and pvc pipe. An old refrigerator box from an appliance store can also be used as a temporary blind. I haven't given up on this idea though. It would be great if I could find a way to get really close to birds so that I could get some closeup photos. The bottom line is that I would like the blind to be where the birds are before I am. That means I will want to use something that I don't have to worry about being stolen. Last week it was brought to my attention that there was a mysterious bird making its way around people's backyards in Orange Connecticut. 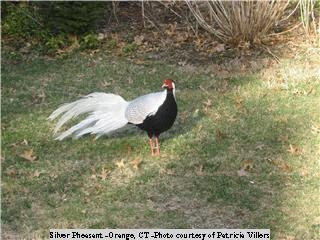 The mystery bird turned out to be a Silver Pheasant which is a bird that is not native to this area. This photo was taken by Patricia Villers. She writes for The New Haven Register and also has her own blog called Late Bloomer Boomer. She recently wrote a story about the Silver Pheasant. Click here to read the article. Here is a short video of a Northern Mockingbird imitating the songs of other birds (No camera shake-I used the tripod!). Can you identify any of the species that the mockingbird is imitating? I mentioned in a previous post that I wanted to see a wider variety of ducks in the month of March than I've seen in previous years. There are two reasons I've been lagging in this area. One is that I didn't have a satisfactory tripod for my scope. I took care of that problem in February when I purchased a tripod at The Eagle Festival. The other reason is that I'm a little bit stubborn when it comes popular places. I like to explore lesser known birding areas but I've come to realize that I'm only cutting myself by employing this strategy. Station 43 in South Windsor is one of the best known birding spots in Connecticut. It has a little marsh/pond that is loaded with waterfowl in the month of March. I knew that I would have an excellent chance of seeing something good if I got there at the crack of dawn. I started my walk down Newberry Road (walk-in only). The sun was just starting to make its appearance but the wind made for very chilly conditions. The place was full of birds singing, blackbirds squawking, doves cooing, woodpeckers drumming, and geese honking. It sounded like an auditorium that was filled with noisy birds. Along the way I saw a number of species but the most notable for me was a Fox Sparrow. I tried to enter the pond area slowly but many of the waterfowl which had been near the shore flew off. As I entered the area where the marsh came into view, I immediately became aware of 3 ducks which looked unfamiliar to me. Before attempting any photos, I looked at them very carefully, making note of all the notable field marks. I was pretty sure that they were Northern Shovelers, but since it was my first time seeing them, I wanted to be extra sure. Here is a photo of them before they took flight. The Northern Shovelers were not the only ducks in the pond. It was also loaded with Ring-necked Ducks, Canada Geese, Black Ducks,Wood Ducks,Green-winged Teal, and who knows what else. I didn't bring my scope because I planned on doing a lot of walking through the fields, but I never made it that far. The water was too high to cross without getting my hiking boots soaked. On the other side of the pond was another surprise - 4 Blue-winged Teal ! These were the first of the year but the I've only seen them once before. I also wanted to check out The Major Michael Donnelly Land Preserve. I found out about this place from two fellow birders that I had met during Big January. As I was heading toward the land preserve (traveling about 50mph), I passed by a small flock of birds gathered in a low bush that caught my attention. Something seemed odd about them. I decided to turn my truck around and head back to have a look. And they say people with cell phones are dangerous on the road - it's a good thing they don't know about birders! That little flock turned out to be Cedar Waxwings. I was able to take a decent photo by using my truck as a blind. By this time I was definitely ready for some breakfast, but South Windsor seems to be sorely lacking in the breakfast diner category. Then, as I spotted this over sized rabbit, I remembered it was Easter. He was waving people into Dunkin Donuts. I guess that would have to do for today. This is a photo of him celebrating my life bird by doing a "Saturday Night Fever" impression! Here is a photo of the entrance to the Donnelly Preserve. Major Michael Donnelly is a Gulf War veteran who contracted ALS. He has been in his own private battle to prove that there is a direct connection between participation in the Gulf War and contraction of ALS. His efforts have helped the families of other veterans affected by the disease. You can read more about his efforts here . The birding was a bit slow here today but I suspect it would be a nice place to visit in the Spring. The total area covers about 115 acres. The habitat consists of a small pond, marshy areas, low-shrubs, woodland, open fields, and it has a small stream running through it as well. The entire area was well laid out for easy access. There are trails, boardwalks, platforms, and several bird blinds. During my short visit I saw 4 Red-tailed Hawks, a Great Blue Heron and my first tail-wagging Eastern Phoebe of the year. The only downside was that there were an awful lot of people walking dogs here which makes it difficult for birding. On my way back home I pulled into The Portland fairgrounds for a quick look around. At the end of the skating pond were 19 Wilson's Snipe. There may have been more but snipe are sneaky. They were sitting pretty in a muddy area covered with tall grass. Yesterday, I made a quick stop at Hammonasset. I saw my first two Osprey of the year on the way in. They were busy checking out one of the platforms which is set up in one of the marsh areas. I also had a nice view of these two Canvasback (above photo). This is the best look I've ever had of these ducks. They were having a grand old time dunking and diving. Other notable sightings included Bufflehead and Northern Harrier. On my way back, I also saw a Rusty Blackbird - (Where's my oil can when I need it? )-and three Wilson's Snipe at White's Farm in Durham. I spent at least an hour trying to get a decent photo or video. I even set my camera up on a tripod trying to get better results. The birds knew I was up to something. They always do. So that about sums up my birding adventures for this weekend- (60 species total). I will leave you with this video of Blue-winged Teal that I saw at Station 43 today. It's not great quality, but along with the wind, you can hear plenty of birds in the background. Also, look for the Canada Geese which fly by in the video. I haven't had an opportunity to do any birding this week. It has been raining much of the week and extremely windy for the last two days. Here's something that I originally posted on a forum two years ago. It's called "Always And Never Birding Advice". These are little sayings that include the words always and never . They have some elements of truth and might be helpful to a new birder, but they're mostly just for fun. Always write a contact number or e-mail on the inside of your field guides. Never set your field guides on the ground while you wander around to get a better look at a bird. Always take the time to help a new birder locate a bird that he/she is having trouble finding. Never say "Oh yeah-I've seen lots of those" when a new birder points out a bird to you. Always be careful when identifying a species you are seeing for the first time. Never come to a conclusion without eliminating all other possibilities. Always turn your cell phone off when you are going on someones field trip. Never have a phone conversation when the field trip is being conducted. Always check to see that you have all your equipment-(binoculars, camera etc.) with you before leaving for your destination. Never wait until you have arrived at your destination before checking making an equipment check. Always check the roof of your car before heading off to your next destination. If you think that you've heard the sound of something sliding off the roof of your car, it may be a good idea to check your rear-view mirror. Always make sure you have positively identified a species before calling it out in front of a group of more experienced birders or use phrases like-"That looks a little like a... but I'm not sure?" to soften the blow of embarrassment you will have from making an incorrect identification. Never try to rush your identification just to beat out the more experienced birders. Always remember to have fun while you are birding. Never take yourself so seriously that you're not having fun anymore. Okay, that's a few off the top of my head. For those of you who would like to participate, I'd like to hear your version of always and never birding advice! This weekend I stopped by the new Cabela's store in East Hartford, Connecticut. I was checking out some of the hunters blinds wondering if I might be able to use them to aid in bird photography and I came across this one. It kind of reminds me of what avid hunters might use as a baby stroller. It is called the Ameristep Chair Blind. It looks pretty small but I was able to sit inside comfortably so I figured for $60 I would give it a try. On Sunday, I went to Wangunk Meadows on the Glastonbury end hoping to get a look at some Blue-winged Teal which had been reported there the night before. This place is less than 5 miles from where I live. As I was entering the meadows, I had a nice view of a very noisy Pileated Woodpecker. I walked through the field a ways and then I saw an over sized mud puddle filled with Green-winged Teal. There were 50 or 60 of them in a little tiny mud hole. Now I can relate to the term "puddle ducks" I've heard some birders use. I set up my scope and started sorting through the ducks hoping to find a Blue-winged Teal. A male Northern Pintail caught my eye. That is one nifty looking duck and the name fits it well. I had one nice look at the pintail someone let their dog loose for a little run. Apparently, ducks don't care much for dogs. I left this area but returned about an hour later. There was just a couple of green-winged teal in the puddle so I thought that I would try out the blind. It sets up very easy. You basically just open the chair and the blind falls into place. I set the blind up about 50 feet away from the puddle. Sitting inside was not a problem but the spot where I set it up was muddy. It was difficult to set the tripod and camera set up the way I wanted it. The next time I try this, I will definitely be more organized. Once I was inside, I could hear ducks flying by but I don't think they were all that fooled by the blind. Maybe it needed to be located near a tree or something to make it look a little bit more natural. One teal finally came in for a landing but I only took one blurry shot before it was off too. I will have to experiment more with this product before I decide whether or not it was worth it. It's definitely not going to be as easy as I thought. After leaving the meadows, I went to Pine Brook Bog off of Terp Road in East Hampton I counted 75 Ring-necked Ducks but I believe the total was closer to 100. I found it to be quite an awesome sight. There was a few Wood ducks there as well. Great Blue Herons are starting to show up around Portland too. I think this photo was from last year at the fairgrounds. I know of an area where there is a heron rookery with about 100 nests. I'll be looking forward to checking in on them soon. What have you been doing to take advantage of the extra daylight? I stopped by Auer Farm in Bloomfield Tuesday afternoon after work. This was a perfect place to unwind and take a walk after work. As I looked at the top of a hill near the apple orchard, I was rewarded with a beautiful view of 8 White-tailed Deer. I zoomed in on 3 of them as they grazed on the all-natural organic grass. Sunday 3/9/08; Searching For New Ducks: In the month of March, waterfowl start to gather together at certain locations before heading to their breeding grounds. From what I read on the COA website, this is called "staging". I decided to search some local ponds hoping to see what turned up. I checked a little pond off of Route 68 in Durham, hoping to spot a couple of Northern Pintail, which had been seen there recently. This is the same pond where I saw my first Ruddy Duck. No luck with the pintail here, but if you look closely at the above photo, you may get a glimpse of the "elusive" Canada Goose. After checking these ponds, I stopped at White Farm Conservation area which is adjacent to The Durham Fairgrounds off of Route 17. The first thing I noticed was that these fields were flooded and had a healthy population of Killdeer. When I used a spotting scope to search the back end of the area I saw a few Green-winged Teal. They soon flew off further into what I believe is a portion of the Durham Meadows Wildlife Management area. It surprises me how small these ducks look when they're flying. They are so tiny compared to Mallards. My main focus, for at least the start of this month, is to check ponds, rivers, marshes, and flooded fields that are fairly close to home. I had a little bit of luck at the beginning of March when I saw a flock of Ring-necked Ducks in Portland. I was close enough to get photos but the I couldn't seem to see its eyes well in any of the photos. Maybe I should go back and read Part I -(How to be a quite good bird photographer)- and Part II -(How to avoid being arrested for Bad Bird Photography)- from the bird photography series at Belltower Birding. I also checked Dooley's Pond in Middletown from the boat launch area. Do you see the Fork-tailed Diving Duck? It's so rare, that it's never been seen by humans. Keep looking toward the left side of the pond. It's going to surface any minute now. As you can probably see-the pond is birdless- at least on this end. I always wonder why certain ponds seem to attract interesting waterfowl while others do not. I know that it has to do with water depth, size of the lake/pond, food sources and location of the ponds. What are some of the other factors? Certain ponds show up on rare bird reports all the time. What makes those ponds so attractive to particular species? My last visit was at Wangunk Meadows in Portland. Once again, it looks like someone went four-wheeling and ended up trashing their vehicle. Something about this picture struck me funny though. Do you see that little yellow container on the ground next to the vehicle? What were they thinking? A little elbow grease and some Clorox Wipes will fix the problem? 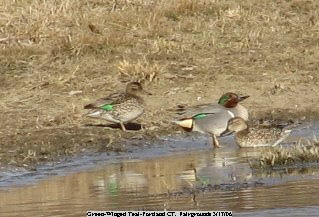 There were more Green-winged Teal at the fairgrounds, but they were out of camera distance. This is the only photo of Green-winged Teal that I have. It was taken a couple of years ago at the same location. They may not be uncommon but I don't often get a chance to see them. I think they're a pretty sharp looking bird. I'll be looking forward to seeing Wilson's Snipe, which have showed up in big numbers at the fairgrounds in the month of March for the last couple of years. My search for is coming along a little bit slowly but I look forward to checking more local ponds and marshes this weekend. I'd like to see some Blue-winged Teal or Northern Pintail this month. Oh, by the way-did I tell you that I hate the whole daylight savings thing? I say just set the clocks ahead and leave them that way forever. It rained all day Saturday. I decided to stick to birding by car, or in my case, birding by truck . I headed out towards New Britain to find Batterson Pond and Stanley Park. I've never been to either of these places but have seen reports of some interesting birds in this area. Most recently there were Lesser Scaup seen at Batterson Pond, and Stanley Park has had Red-headed Woodpeckers in past years. During my travels, I listened to the Kevin Lynch Bluegrass Show on WWUH, which is broadcast Saturday mornings on FM radio 91.3 or on the Internet via this link. I listen to a wide variety of music, but I really prefer music that has a live, unrehearsed feel to it. I like a band or performer who puts a lot of emotion into what they're doing. A lot of music is over produced for the purpose of selling more records. Good music doesn't need a lot of production. That's what I like about traditional bluegrass. It doesn't sound overly produced. The performances stand on their own. Bluegrass also conveys to me an image of a simpler life. Man's attempt to continually fix the world has made life more complicated than it needs to be. After a couple of missed turns I found my way into Stanley Park. There seems to be different sectors of this park. I started out in an area that had several Crab apple Trees with fruit still intact. I spent about 45 minutes there watching birds feeding on crab apples in the tree and on the ground. I first noticed American Goldfinches eating small dark fruit from one of the trees. I thought this to be odd because I'm pretty sure that they are primarily seed eaters. I wonder if they were extracting the seeds from inside the fruit the way that Pine Grosbeaks do? Then there were the robins, including the two seen in the top photo. They were stuffing their faces at a pretty good rate. I noticed that they paid no mind to the goldfinches but when some Cedar Waxwings showed up they really ganged up on them. They chased the waxwings off in a very noisy show of force. I did capture a video of a Cedar Waxwing eating crab apples, but due to the rain and lighting, it was very grainy . There were some Brown Cowbirds, European Starlings, and Common Grackles feeding in the grass across the way. Of course, there were many other birds in the area but I like to focusing on birds that were the most significant to me. The ponds in Stanley Park didn't produce any surprises for me. There were Mallards, domestic geese, and Canada Geese. My next stop was Batterson Pond. I pulled off in an area that offered access to the pond along a stretch of grassy area. There were about 14 Hooded Mergansers there, but outside of Mallards, I have a hard time sneaking up on waterfowl. When I moved towards them, they moved away from me. We were like two repelling magnets. I tried sneaking up behind a tree but they knew it! Anyway, here's a photo(above) of two that I saw there. Maybe I should paint the hood of my sweatshirt to look like a male Hooded Merganser next time. I also some Ring-necked Ducks, a Belted Kingfisher, and a few gulls here but not much else. I'm going to talk about the European Starling a little bit. Most of you know that starlings are not native to North America. One hundred birds were released in New York City's Central Park in the 1890's. They were released by a group of people that wanted to bring all of the birds mentioned in Shakespeare's works to America. Since then, their population has grown to an estimated 200 million birds. Many people hate these birds with a passion. They are known to aggressively compete with other native species of birds for nesting cavities. Although, from what I have read thus far, the Yellow-bellied Sapsucker is the only species whose population decrease has been proven to be directly linked to starlings. They form large flocks that can make quite a mess and can wipe out your backyard suet cakes in no time. They are also a problem for farmers who grow fruit crops because they consume a lot of fruit. There is another side to the story though. Some of their habits are considered beneficial in that they eat insects including clover weevils, cutworms, ants, wasps and several types of beetles. I'm not trying to convince anyone to be an admirer of the starling. I'm just pointing out that as with anything else there is more than one side to the story. If there is good reason for having to control their population, then so be it. I will say this though; the starling didn't ask to be introduced here, so what sense does it make to be angry at them for being here? They may not be a native species but they have certainly done a good job of surviving. Isn't trying to survive what a species is supposed to do? It doesn't seem that they're going away anytime soon. I'll bet that if they're near extinction in 50 years there will be people that desperately try to bring them back. We have a habit of killing things off then trying to bring them back. Although starlings aren't one of my favorites birds, they can be very interesting to watch. So with that, I will leave you with a video of 3 starlings taking a bath in a puddle on a rainy day. Carpooling is something that I've heard about for years but it was never something that I seriously considered. I've talked about the possibility from time to time but I felt that it would too inconvenient. There's an expression that I've heard over the years that says: The definition of insanity is doing the same thing over and over but expecting different results. I was tired of driving a total of 62 miles round trip each day to and from work. I was tired of filling my truck with gas that now exceeds $3.00 per gallon and is soon to reach $4.00 per gallon. It's not just the cost either. It bothers me that our country is so dependent upon other countries for oil. 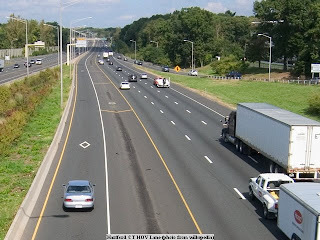 There's also the consideration of the effect that driving automobiles has on our environment. I finally decided to do something about it. I started out by looking into a program called EasyStreet, which is a van pooling service for commuters. Unfortunately,they didn't have a van pool that would match up well with my driving route. I also found out that it is more expensive than I would have thought it to be. How about the bus? I would have to drive to Middletown to catch a bus by 5:45 am, which would get me to work in Bloomfield by 8am. That was too much of a stretch to work for me. Finally, I searched the Internet to see if there was any online carpooling programs and as it turns out there were several. Walking-I've been meaning to spend more time walking as a form of exercise but I've been putting it off to do other things. This will give me a perfect opportunity to do some walking. Library-There is a library along the route. I can spend hours in a library looking through books and magazines. Stopping at Borders Book Store to check out the latest in Field Guides and birding magazines. Food shopping-this would be a good time to get it done. Oh yeah-if all that's not enough, I suppose I could force myself to do a little birding after work. It could be a bit of a hardship on me but I think I'll get over it. So is carpooling worth the trouble? I can't give a definitive answer to that question yet but I have a chance to save $1,000+ dollars a year on gas and 6,000 miles a year on my truck (I also get to use the controversial HOV lane). That gives me enough incentive to want to find out. I woke up this morning full of energy knowing that I had the day off from work. I did, however, have some difficulty in deciding where I would go and what type of birding I would do. There has been a Tundra Swan reported down in the Stratford Area. That would be a lifer for me but it is also a 100 mile round trip and that's not really my favorite part of the state. I decided to do some hiking at nearby Salmon River off of Route 16 in East Hampton. My hike started out with a walk across The Comstock Bridge which was built in the 1800's. Take a look at the inside of this bridge. It almost looks like paradise is waiting on the other side. I spent some time looking at some of the initials and dates carved into the beams. There were dozens to look at. I wonder how many of the couples who carved their names inside a heart are still together? How many of those who carved their initials here are still alive? What were there lives like then as compared to now? C.J. must have been standing almost where I was when he/she carved their initials into this wood 90 years ago. I spent some time hiking around the trails of Salmon River. I saw nice numbers of Black-capped Chickadees, Carolina Wrens, White-throated Sparrows, an Eastern Bluebird, White-breasted Nuthatches, Dark-eyed Jucos, Northern Cardinals, Northern Mockingbird, Red-tailed Hawk, Red-bellied and Downy Woodpeckers. The trails were very icy though,so I didn't get too far. I also walked some of the Airline Rail Trail from a parking lot access off of Bull Hill Road. Not for long though. It must have decided that I was a suspicious looking character as it flew off to a distant tree. Those darned immature eagles! Why can't they act their age? The Black-backed Gulls and Common Mergansers are still having a grand old time at the cove. We saw one Black-backed Gull eating a small fish close to shore. When it noticed we were watching, it put the dead fish back in the water and swam about 10 feet away from it. I don't think the gull wanted us to know he had a fish. It went right back to eating it as soon as we moved away. We also saw a small group of American Crows fighting over a fish. I also climbed to the top of Great Hill Mountain from the blue trail off of Gadpouch Hill Road in Portland. I passed a young couple on the way up. They let me know that the path was not all that slippery and told me that they had seen Turkey Vultures flying in the area. It's really nice to watch hawks and vultures from a high elevation. It almost makes me wish I had a hang glider so that I could join them. At the bottom of Great Hill is a pond which shockingly is called Great Hill Pond. I enjoyed seeing a group of 35 Ring-necked Ducks dunking and diving. Thirty-five is the most that I've seen at one time in this pond. The three Hooded Mergansers that I saw there last weekend are also still there. In my immediate neighborhood I noticed a flock of 50+ Common grackles. There were a few Brown-headed Cowbirds and Red-winged Blackbirds in the area as well. Ring-billed Gulls continue to search for scraps of bread in people's yards. The last bird of note that I saw today was this adult Bald Eagle which basically flew over my house. I enjoyed my day of hiking and birding- but it's back to work tomorrow. This is a video of a Turkey Vulture soaring that I took from the top of Great Hill. Judging by the quality, you would think that it was done by Inspector Clouseau. If you listen closely, you can hear me muttering in frustration as I fail to keep the bird in the frame. I did enjoy the part when the vulture flapped its wings.